Layla Zami is an innovative and interdisciplinary artist, academic, curator and globetrotter. She is currently a Visiting Assistant Professor of Humanities and Media Studies in the Performance and Performance Studies Program at Pratt Institute in Brooklyn, NY. Layla holds a PhD from Humboldt-University, Berlin, funded by ELES (2013-2016). She also holds an MA from Sciences Po Paris and a Saxophone Diploma from the Conservatoire de Musique du Mans. As a Resident Artist with the dance company Oxana Chi & Ensemble Xinren, Layla toured across the globe, creating and performing music (saxophone, kalimba, chalumeau, loops), poetry and physical theater in dialogue with the choreography. With Oxana Chi, she co-directed the award-winning documentary Dancing Through Gardens (Durch Gärten Tanzen). Layla serves on the Board of the International Human Rights Art Festival and is a Founding Member of the Dance/NYC Programming Symposium Committee. 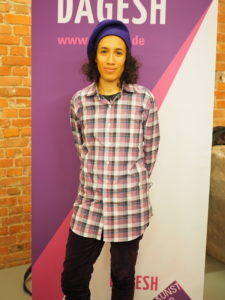 Born in Paris in 1985, she draws from her rich Jewish-European-Russian-Caribbean cultural heritage to generate socially conscious art, research and teaching. My work orbits around matters of body/corporeality; memory/historical trauma; diaspora/migration; race/gender and spacetime. Carrying many worlds in me, as well as many past lives, I let my multidisciplinary talents and research interests unfold in the now. My aim is to create connections between multiple forms of expressions and emotions, and to use art to raise awareness about the necessity for and possibility of social change. Contemporary PerforMemory: Moving Through Diasporic Dancescapes in the 21st Century. Berlin: Humboldt-University. „Tanzkunst als lebendige Erinnerung“ In Neues Judentum – altes Erinnern? Zeiträume des Gedenkens, edited by Dimitrij Belkin, Lara Hensch, and Eva Lezzi, 267-288. Berlin: Hentrich&Hentrich / ELES. „Oxana Chis Tänzerische Wissensschaffung: Biographische Erinnerung an Tatjana Barbakoff aus feministischer Perspektive.“ In Sichtbar Unsichtbar. Geschlechterwissen in (Auto-)Biographischen Texten, edited by Maria Heidegger, Nina Kogler, Ursula A. Schneider, and Annette Steinsiek, 259–274. Bielefeld: Transcript. With the working group AK ForschungsHandeln: InterdepenDenken: Wie Positionierung und Intersektionalität forschend gestalten. wissen_bewegen. Berlin: w_orten&meer, wissen_bewegen. As a Resident Artist with Oxana Chi & Ensemble Xinren, Layla Zami is a main protagonist in the productions feelingJAZZ (2018) and I Step On Air (since 2013). She also appears in other performances such as Through Gardens and Neferet iti.